Back in October, I received my absolute favorite perk from Klout since agreeing to be an influencer with them. Perks are freebies from companies looking for opinions, usually on new products, and they often come in the way of a small ($5) gift card or trial size sample. 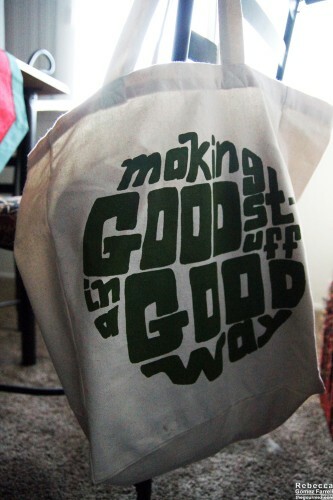 But this one was a whole gift pack full of items made with fair-trade practices in mind. It’s taken me this long to write it up because there was so much to try! Now, fair trade is a cause I’m passionate about. Being a progressive, I feel that people should be able to make a living from their wages for full-time work, and companies that embrace that philosophy take hands-on approaches to ensure that the people who make their products are working in acceptable conditions and that they are fairly compensated for their work, whether done in Ghana or Indiana. Each and every product I’ve tried from this pack is certified by Fair Trade USA, which makes me quite happy. I’m giving a quick review for each one. 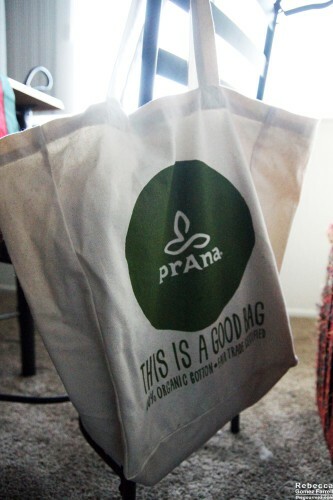 That tote bag is from prAna, a company that specializes in sustainable, fair-trade apparel. I’ve been using it as a gym bag for months, and it’s quite durable. The quality of the cotton material is great, and I’m going to keep my eyes peeled for where I can find their clothes. 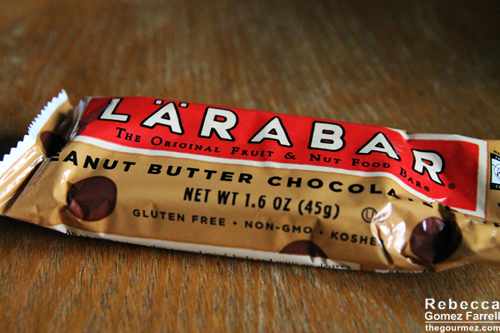 Larabar sent a gluten-free, peanut butter and chocolate snack bar that is way tastier than protein bars, let me tell you. 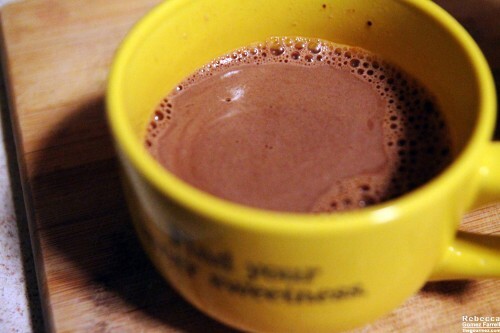 It tasted like moistened peanuts, cocoa powder, and tangy dates. 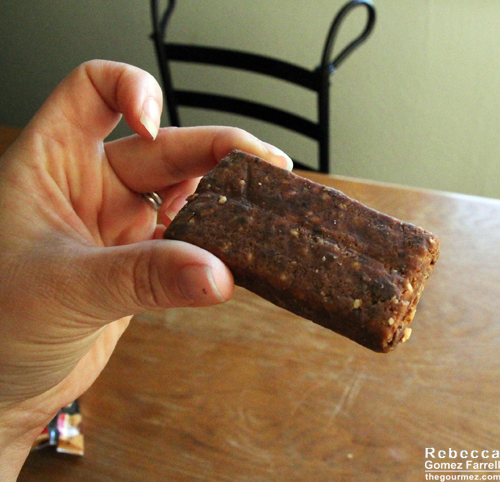 Each bar has 220 calories, half of which are fat, and 3 grams of fiber! Not bad for a quick snack at all. 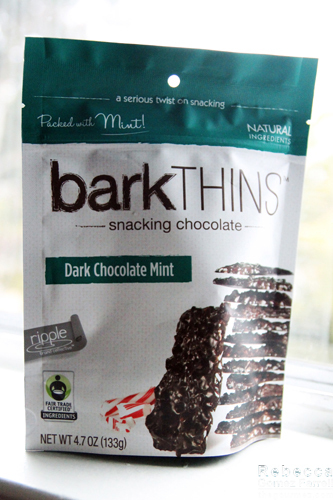 My favorite treat in the pack were the BarkTHINS peppermint snacking chocolates. 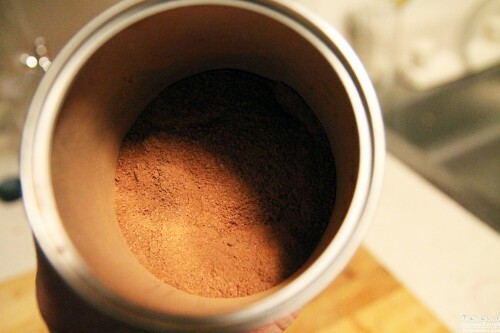 They tasted indulgent but were nearly guilt free…if you don’t count ingredients like cocoa fat. 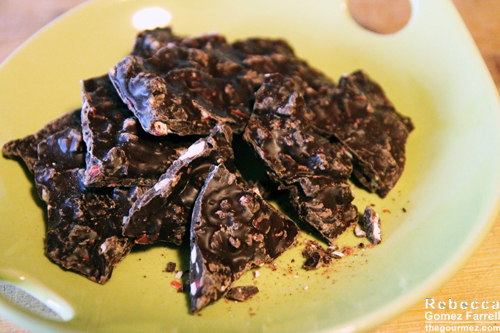 😉 The all-natural, chemical-free ingredients were combined into thin pieces of dark-chocolate bark peppered with chunks of broken peppermint candy. And they were GOOD. The mint had a strong presence, for those of you averse to that. I am not and will happily eat your share. Next up was the Archer Farms coffee, known as the store brand for any Target shoppers. 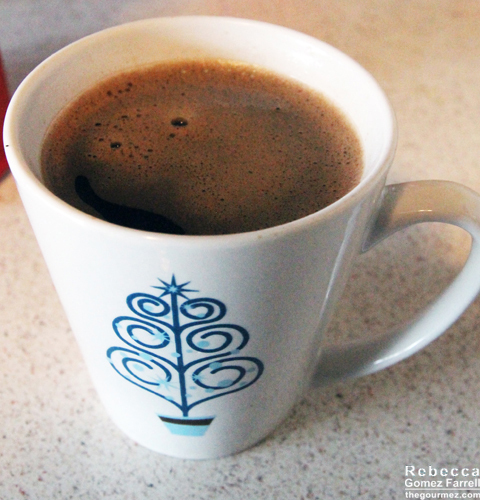 A brewed cup smelled of chocolate, forest, and maybe citrus zest. The taste was similar with an emphasis on the forest soil. It’s earthy, dark, and a nice blend for me. I enjoyed how the hint of citrus came out at the very end of a sip. 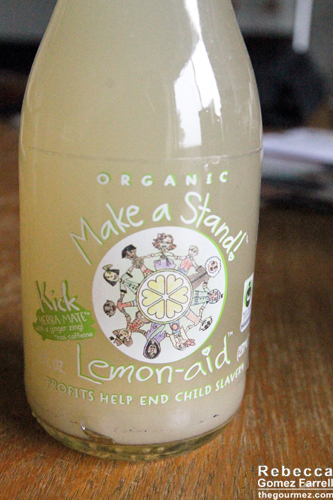 The Make A Stand Lemon-Aid is a new product on the markets, and it comes with a cute backstory. The company was founded by an eight-year-old girl inspired to make change through promoting fair-trade practices at her own front-yard lemonade stand. Through Edgemakers, Vivienne Harr’s unique drink is now available for purchase. It comes with a kick of ginger and yerba mate, which makes for a fun contrast in flavors. You can taste that ginger! The yerba mate bitterness didn’t work for me, but it’s more exciting than regular lemonade. 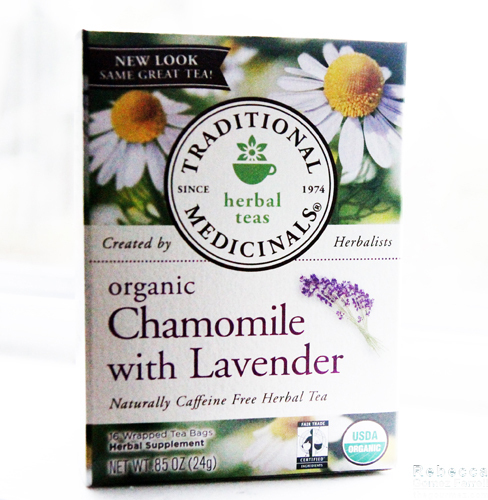 Traditional Medicinals chamomile with lavender herbal tea is less about a relaxing drink and more about the health benefits of a cup. You can tell that intent from the instructions for brewing: two tea bags recommended per cup, ten minutes of steeping time, and a tip to squeeze the excess liquid from the tea bag after. Those instructions are all about how to grab the most nutrients from the tea, not about how to get the best flavor from it. So you’d be right if you’re guessing by now that this tea tasted stronger and bitterer than a comparable herbal tea. 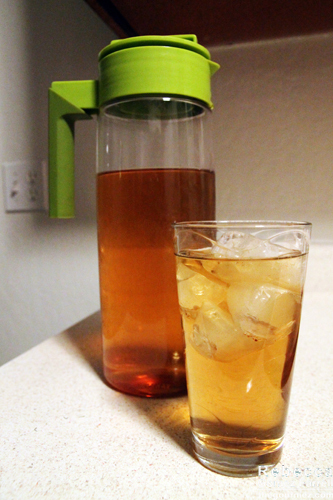 I used it as iced tea, mostly. I can’t speak to its medicinal properties, but it did the job of tea, providing a sense of warmth and the knowledge that good stuff was going down your gullet. 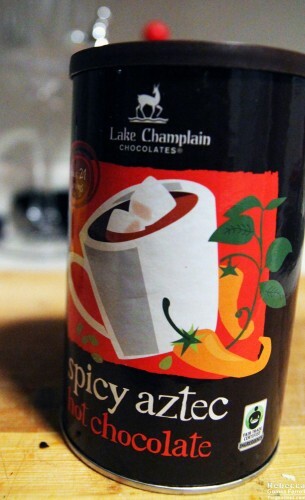 Lake Champlain Chocolates spicy Aztec hot chocolate was my second favorite of the freebies—if you’ve noticed a chocolate trend among my favorites, you may be onto something. I make my hot chocolates with almond milk, and no, I’m not fancy enough for whipped cream as you can tell from the picture. Except when I am, and then adding in a dash of peppermint or almond extract is AMAZING, but that didn’t happen this month. I followed the directions, and the end cuppa yields a lovely, moderately dark chocolate shade rather than the light supermarket stuff that skimps on the actual chocolate. It tasted genuine with no false sweetness. There is a smidge of chili and cinnamon involved, which adds a rich, smoky layer that is only the tiniest bit spicy. That added depth shines most toward the end of the cup. The mix stirs well into mochas and iced coffees, too! I enjoyed trying these fair-trade products, and I hope that share of the market only grows in the future. I know I’ll continue to support it with my dollars, and most of these companies will definitely reap those benefits. I hope you’ll take the time to consider fair-trade certified products in your purchases, too. 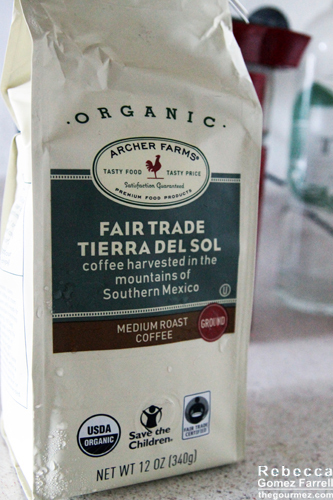 Thanks for the perk, Klout and Fair Trade USA! Wow, what an amazing blog post! Thank you so much Rebecca for your kind words of support for Fair Trade! It’s thanks to people like yourself that together we can make a big difference in the lives of farming communities around the world. Thank you for the gift pack! Great information.i hope you will write another good post to update us !